You might not remember dining at Bodrum on Cowley Road, but if you've ever had one too many drinks in East Oxford, chances are you've probably stumbled in for a kebab. Bodrum's one of the many take-away joints lining the stretch from Randolph Street to Leopold Street: but it's the only one that has a queue come 2am. It turns out even drunken revellers can be discerning - Bodrum's grub is a cut above the usual chips n' cheese offerings. There's much more than doner meat, burgers and chips on the menu at Bodrum. Pass the take-away counter and take a seat at one of the few tables and you'll be offered a menu. Make no mistake, there are no frills here: the menu's laminated plastic and the surroundings are frippery-free, but there's waitress service and a pleasantly buzzing, low key atmosphere. The extensive menu ranges from starters such as houmous and falafel through kebabs to vegetarian dishes, casseroles, steak and pide (Turkish pizza), with burgers and curry thrown in for good measure. Understandably, steak tops the price range, but order anything else and you'll walk away with change from a tenner. Probably quite a bit of change, to be honest. On our Friday evening visit, Turkish food lovers M and D both opted for kebabs: a chicken sheek kebab (£6.95) for M and a Bodrum kebab (chicken sheek, lamb kofte and doner meat, £7.95) for D. I was impressed at the number of vegetarian options: 4 combined plates, a vegetarian kebab and vegetarian pide, in addition to the ubiquitous houmous and falafel. 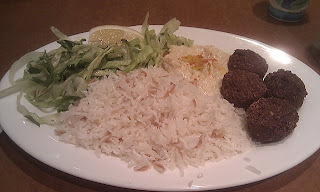 I opted for one of the combined plates - houmous, falafel and borek (feta pastries), served with rice and salad (£5.95). After ordering, we were presented with a basket of fresh, warm pitta bread along with a plate of dips to pick at while we waited. Our orders arrived soon enough, but mine turned up minus the borek - the waitress thought I'd ordered the borek-free option. It was quickly rectified by her asking the kitchen to rustle some up. My first impression was that the low price didn't translate into small portion size: Bodrum know how to fill a plate. 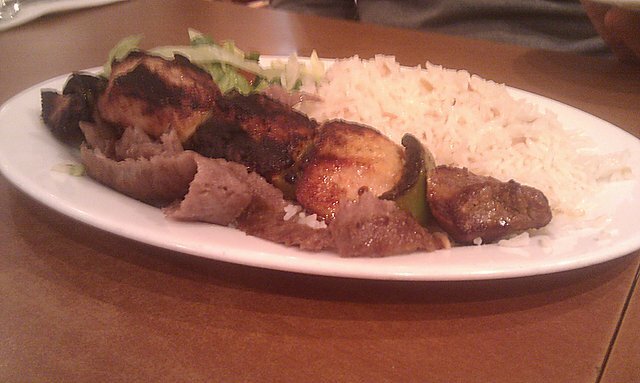 D's Bodrum kebab was a realy meat feast, with succulent chunks of grilled chicken, well-seasoned kofte and tasty doner meat that managed not to be too greasy. M's chicken kebab was similarly praised, with both pointing to the addition of a wedge of lemon as a good touch, helping to add flavour. My vegetarian option went down a treat: the tasty falafel were slightly crisp on the outside with a softer, lightly spiced centre (not at all dry, as I often find), good houmous and plenty of Turkish rice, cooked with butter. 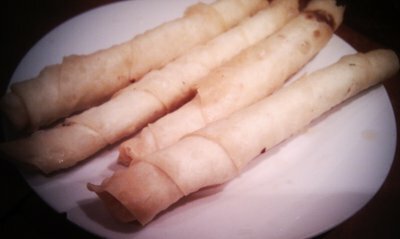 I have to admit the borek weren't as good as M's own homemade version and could have done with more feta filling, but the pastry was still decent. We all agreed that everything was just a touch too salty, but with such huge, tasty portions for a bargain price, there was no cause for complaint. Lesson learnt: don't just consign Bodrum to post-midnight visits. There's an excellent reason why it's Oxford's longest running kebab shop. And with new, more upmarket premises now open on Park End Street, it looks like Bodrum will stay king of the kebabs for the foreseeable future. Bodrum is at 242 Cowley Road, Oxford OX4 1UH. Tel: 0185 249981. No deliveries. Love the review and foods specially kebab.... I always order kebab through takeaway online.